Since writing an earlier blog on using Twitter in your job hunt, I keep coming across evidence that this method of connecting with employers is steadily growing. Scanning articles on Stuff earlier this month I came across an interesting article published by Business Day about tweeting your CV. I guess I should have known it would be only a matter of time before CV tweets become a popular method of identifying both employers and employees. So you think it’s difficult trying to get everything you want to say in a CV down to 3, maybe 4 pages? How about trying to do it in 140 characters? Earlier this month The Guardian reported that media executive Alan Geere asked budding reporters to apply for a job by tweet. In his blog he said that he was fed up wading through piles and piles of awful CVs and Cover Letters. Check out Greg Jericho on Twitter – http://twitter.com/#!/grogsgamut. He has more than 9,000 followers including politicians, journalists and academics, and has attracted both praise and censure for his commentary. In August this year he quit his job as a public servant and is soon to be working as a researcher for the new Chase project in Australia – The Hamster Wheel. He credits Twitter with getting him the job – but…it took much more than just one tweet. Greg reckons that Twitter is a great way to build relationships – and he credits these relationships with getting him the job. Rather than cold calling organisations, you can follow people who are tweeting and blogging and over time, this becomes sort of an interview as you have been able to see what people tweet or blog about so can begin to get a feel for the kind of person that they are and the interests that they have. Campaign strategist Mark Textor has also reported hiring two people to his firm Crosby/Textor , a market research and communications agency, through social media. He found using Twitter a much better process than going through a recruitment agency. It saved time and enabled him to filter in and identify talent quite early on. The fact that you can communicate in 140 characters what is or is not the essence of an issue, signals talent. Check out the US site www.tweetmyjob.com. It shows individuals how connected they are to employees in their preferred fields. Companies like Sony and Motorola are hiring on the site. 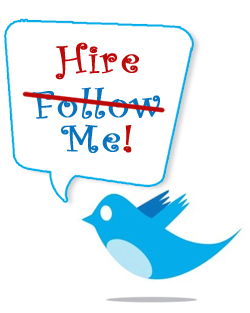 Although Twitter was not designed for recruitment, it can supplement current recruitment strategies. The use of social media is certainly on the increase and we may well see sites like Twitter replacing traditional job seeking methods. So, if you already tweet, think about tweeting more strategically and you may well be on your way to landing your dream job!